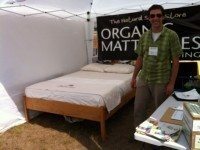 I have been working for The Natural Sleep Store since 2007. I opened The Natural Sleep Store’s Denver showroom when we expanded our operation in April of 2008. I manage the Denver store and all of The Natural Sleep Store’s shipping and receiving. Growing up I was introduced to natural products by my aunt and uncle who grew their own organic food and used natural home products a long time before it was the norm. I also have a background in the natural foods industry, where I learned further about the benefits of organics as it applies to everyday life. I took the opportunity to work for Corinna because I believe that she started this business as an extension of how she wanted to live her life, and I can relate to this. My family and I incorporate organics in our daily life as much as possible: from food, to sleep, to cleaning products. I believe that we have reached a point in society where it is very important to look into how things are made and produced; both from a manufacturing standpoint and from a consumer’s standpoint. Because of this, I believe more and more people want to be “educated instead of sold.” I also believe that if you work in a field you are passionate about, the experience becomes much more fulfilling. I would hope that my dedication translates directly to the consumers experience. It is my goal at The Natural Sleep Store to be as receptive as possible and do my very best to help our potential customers by answering any and all questions. I would much rather spend extra time with a customer until they are sure of the exact product to purchase, than have them make a decision that they aren’t sure about.